The pottery-making tradition, so central to Acoma identity and culture, is in danger of being lost. Along with the traditional pottery are associated deeply held values and knowledge, including language that is also endangered. 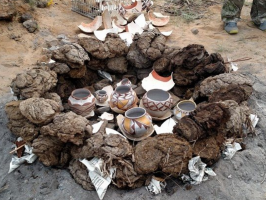 The Haak’u Museum coordinated pottery making classes to address the urgent need to preserve and sustain Acoma’s renowned pottery making tradition. This exhibit will showcase the work of the participants ranging from beginners, intermediate and experienced levels along with older Acoma pottery.